The Honourable Justice Ferdinand Algernon Smith, J.A. (ret’d) C.D, was born in Kingston on January 21, 1940. He had his early education at Excelsior College. Mr. Justice Smith was called to the Bar at Lincoln’s Inn in July 1968. He served as Deputy Clerk and Clerk of Courts from 1968 to 1973 and has held the posts of Crown Counsel, Assistant Director of Public Prosecutions and Deputy Director of Public Prosecutions. 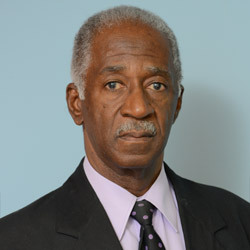 Mr. Justice Smith has served over 30 years as an Associate Tutor at the Norman Manley Law School. Mr. Justice Smith was elevated to the Bench in 1986 and was appointed a High Court Judge in 1988 where he served for 13 years. He was appointed a Court of Appeal Judge in 2001. Prior to his retirement in 2010, Justice Smith was awarded the Order of Distinction, Commander Class, in 2008 and in 2010 he was appointed to the Local Privy Council. Justice Smith is the Chairman of the Constituted Authority. He was appointed Chairman of the Commission for the Prevention of Corruption by the Governor General in 2012. In 2011 Justice Smith was honoured by his colleagues of the Jamaica Bar Association. He is a Deacon at the Bethel Baptist Church in Half Way Tree. He is married to Veronica and there are three sons of the union.